It didn’t take long for the attendees at Sotheby’s on October 5, 2018 to realize that something wasn’t right. 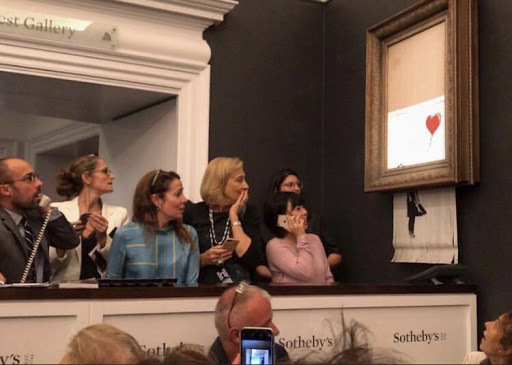 The British street artist Banksy had just achieved a record sale with his immediately recognizable Girl with a Balloon, fetching 1.4million USD (the gavel hammered at 953,829 GBP, exactly his previous record). Immediately upon the auction’s close a mechanism in the frame of the piece activated, spitting the artwork out of the bottom, now shredded. There are reports of an incident between an individual and security on the site and the artist posted the following photograph to his Instagram with the caption “Going, going, gone…” begging the question if the elusive artist was in attendance at the auction and if he had triggered the artwork’s destruction himself. The expressions on the faces in the photograph could not more perfectly describe the scene as it unfolded. Confusion, amusement, bewilderment and horror wash across each individual and the moment is captured in what appears to be a carefully calculated moment. Banksy is no stranger to pranks but one has not been pulled at an auction, notably at the record price earned from this sale. 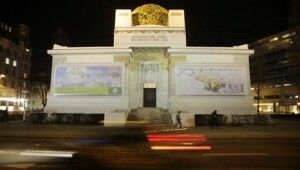 The auction house is in an unusual quagmire, with a completed sale and a now “destroyed” work of art. Sotheby’s has yet to comment on how they will proceed with the sale as the transformation of a work at its auction’s completion is uncharted territory. The immediate questions surrounding the artwork’s destruction are whether the act now makes the artwork more valuable or is the performance of the destruction the real star of the show? The piece still exists, albeit now rendered to strips of canvas hanging from the frame, but serves as a physical remnant of the spectacle of which the auction house’s head of Contemporary Art, Alex Branczik, states he was not complicit. Should we reflect on the value of artwork and the sale of these pieces at major auction houses? Can destruction be as valuable a transformation as construction or repurposing? Is there a greater vision to be seen here or is Banksy just having a giggle at us? News stories courtesy of New York Post and The Art Newspaper. UPDATE: Banksy shared a video of the construction of the shredder inside and the destruction of Girl With a Balloon on his Instagram.